It’s always interesting to see how the different unit testing frameworks approach automated testing, each framework has it’s own style, approach and feature set with everyone having their own view on which framework everyone should use. 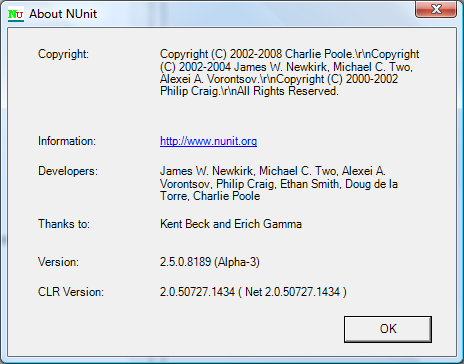 One of the more (you could say most) popular .Net framework is NUnit and over the past few months Charlie has been working on v2.5 so I thought it was about time I took a look. 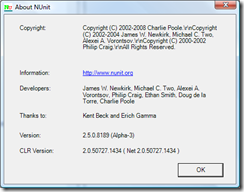 Similar to XUnit and MbUnit, NUnit 2.5 includes the concept of parameterised tests. RowTest was included in 2.4.7, however additional attributes have now been included. 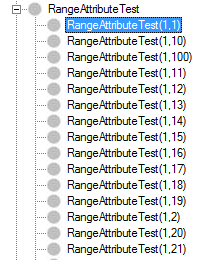 The first new attribute allows for combinational style testing, this is where two sets of inputs are combined to create each possible test combination. In certain situations useful – always good to have in the toolbox, however generally I wouldn’t need to use this on a day-to-day basis. MbUnit has had this for a while, however I prefer the syntax of this approach, which I think is a similar syntax to MbUnit V3. To implement this, you add the ValuesAttribute, which takes an object array for the test values, before the method parameter. 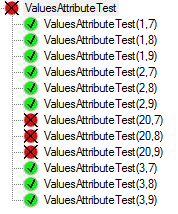 When NUnit loads this up, they create a combination of the test values, as a result we have 12 tests created. If we had another parameter of the test, for example with 3 possible values, then we would have another possible combination and we would have 36 tests. As a result, you can very quickly build up a good selection of test cases. Similar to the ValuesAttribute, however instead of you defining the values, you define the range of possible values which NUnit then creates tests for. You define the range (min, max) and NUnit does the rest. The values are then combined in a combinational style. Similar to the two previous attributes, Random produces a set of random input. You can either give it a count of the inputs to use, as I have done with the first attribute which produces 10 random values, while in the second parameter I provide the min and max range for the random values together with the amount of data to produce. However, I’m not sure how useful testing against random data would actually be? This attribute is similar to RowTest, however as part of the TestCase you can set your own TestName which I think is actually really useful. The TestCase is then reflected In the GUI and report. The first two tests use the test method name plus their parameter inputs, while the third uses the TestName property we set on the TestCaseAttribute. Also as part of the TestCaseAtribute, you are able to provide the Result. Generally, the expected result is passed in as a parameter and verified within the test itself. With this approach you have the result as part of the TestCase itself, with the test returning it’s result which NUnit then compares to decide if the test has passed. This does make more sense as the parameters of the test as then really test inputs with the test output being verified as an output, a small difference however it is more logical. This approach to testing has a lot of potential use cases and opportunities as it really increases test case (code) reuse and test maintenance. Similar to MbUnit’s FactoryAttribute, you define a class which yield returns each TestCaseData object. It has the advantage of using a fluent interface to define all the different properties, such as results and the test name. While I have hardcoded the 4 test cases here, there is nothing stopping you dynamically creating these. Simple, straight forward. Does the method call throw can exception? Simpler approach, Assert that the method does not throw any exceptions when it is called. If they are not available and you execute the test, it will fail but will actually tell you the reason why. Finally, there is a new PlatformAttribute. This attribute defines which platforms the test is allowed to run on, really useful if you have issues with a certain target platform, or if you have a set of tests only targeting a platform, such as mono. When the test is executed on an invalid platform, the test is skipped. This post has summarised all of the interesting bits of the new Alpha release. In future releases, I expect to see some changes going forward before the final 2.5 release. It’s nice to see NUnit taking the different approaches from the different frameworks and incorporating them with their own approach, hopefully v3 will have some really interesting concepts. 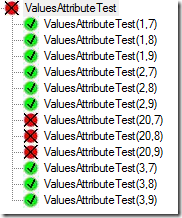 The main feature missing at the moment are data driven test attributes, such as pulling test cases from CSV or SQL Server, but a framework has an additional extension point to make this attribute easier to write. After this I think most of the missing features would be more suitable in NUnit 3.0. Nice article Ben… I’ll point it out to people on the NUnit list. One point of info: PlatformAttribute has actually been around for a while, so 2.4 users can also make use of it. I’ve been using the 2.5 Alpha and have found it to be really stable. The [TestCase] attribute has been extremely useful in the work I do. I disagree about the usefulness of the [Random] tag, I think it’s really a great idea with real world application. It could become somewhat less useful in 3.0 when the full [Theory] approach will (hopefully) be supported, but this will do for now in creating theory type tests… search “David Saff Theory” on Google if you are interested in the approach, really good stuff. 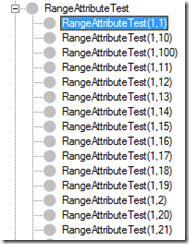 Is there a .Net test library and GUI combo that allows parameters in the test cases, and the GUI is able to inspect the params and render for a tester the appropriate controls to allow them to add their own values? (And ideally, save off those values in a test session). Our situation is.. that we have many testers who aren’t coders currently and would be cool to provide an interface that provides an entry into our test cases and dlls without needing them to fire-up visual studio! Or am I just babying the testers too much? !